Ah, yes. It was time! That day, crystal flakes glided down from the Gods' realms, just like the best gift the great Shardas has ever given. The naked trees, dotted along the edges of the horizon, groaned and mourned under the weight of the snow that lay innocently on their branches. The snow fell softly to the silent ground at the first sigh of the wind. With the mystery of the night, and the silence so deep and white, the day had the creepiness of the worlds end. The ether above was dotted, bespeckled with the stars of the late night yesterday. 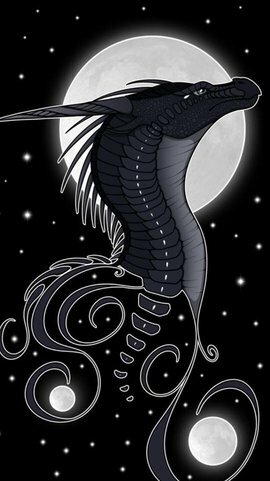 But the sun shone through the clouds, and the fading, luminous moon sat in the corner, grinning down widely to the Ice Dragons. It was all here, the sun, moon, stars, and snow... what a grand day to host a festival. Apolis was in the feasting hall, in a petite, still vast, throne. Next to that throne were three others, adorned differently, but for different Councilmen and women. The ground of which the marble table next to the thrones was higher than the ones for others, so they may view their people downwards. Below them was a larger marble table, covered in an assortment of meats and dishes, large fish and some live. Above hung an ice chandelier, adorned with jewels and was the centerpiece of the room. Around them, on the walls, were a dozen of IceWing drapes with exquisite patterns. And below those drapes were guards, circling the edges of the hall, with chipper, stoic expressions. The gates had open, and the cold, fresh air had invaded the moist scents of meat and dishes, and citizens began to fill the room. Archelaus emerged into the hall with powerful strides full of purpose, his stature was ever a one of regal elegance. His eerie dark eyes exterminated the the illustrious scene before him in high regard, his silent scrutiny took in all the wonders of the atrium. His expression was ever stern and apathetic all the while as he moved closer to the throne, no doubt joined by the others of the Tribe as the room would quickly flock with Icewings. Making his way before the several thrones and notably in front of Apolis, he'd lower his visage in a graceful bow as he cranes his neck. He'd mutter "You're eminence", as a formal greeting although doesn't expect a personal reply, as he raises his posture awaiting for others to settle and Apolis to give a opening address before the Festivities and feast truly begin. Zaroc had entered the feasting hall to -once again- admire the look of the radiant hallway, when the smell of fish and meats caught the adult drake's attention. The icewing turned from looking at the designs and his white eyes fell on the feast that lay before them. He looked up, and saw his majesty sitting on the throne. He dipped his head, not minding if his eminance didn't see him, and he took his seat with the other, lower ranked dragons. He watched the guards circling the room, wondering how they managed it, circling and patrolling all day long. Zaroc was a civilian, and did his duties EXTREMELY eagerly, but he wanted a higher rank. So he could serve his tribe better. A vulcan? Maybe. Scholar? More of a maybe. Coucil member? Ha! He felt stupid for even thinking that! Zaroc wasn't sure. But he hoped he'd be able to serve his tribe MUCH better in the future. Not that there was anything wrong with the lower rankers! No! Arkhor no! Anyways, Zaroc shook himself from his ambitious train of thought and gazed at the walls with the patterns, smiling softly at the detail. Kyuurei ran into the hall, he doesn't think running was allowed here but he thought he was late for an event again. He stopped running as the decorations caught his attention. He wandered around, looking at the impressive decorations of the feasting hall for a while, wondering why he haven't notice those before. Avoiding the smell of the food as he doesn't feel like eating yet, he saw the king sitting on his throne, he bowed down to his majesty, not expecting anything from him and continued to admire the decorations of the hall. Swiftly the furred dragon manoeuvred through the moving crowd heading towards the hall, occasionally beating her wings to keep her frame upright. A smile was present on her maw as she passed the doors and emerged into the grand hall. Quickly she dropped to the floor and folded her feathered wings neatly behind her striding towards her Emperor, passing several dragons she gave each a smile of acknowledgement. How very exciting this was, she had been within the palace several times, however, never for such an occasion, oh she adored such festivals. The music, food and of course the very presence of her kin allowed her to feel comfortable. She halted before the raised platform which carried the throne and her King, her face was a canvas of amiability carrying a smile which was ever present. She lowered her frame to a noticeable low bow before she spoke "My Liege" simple words they were, but no more were required. She rose swiftly and allowed her gaze to wander around the hall, she smiled at the dragons close to her Emperor and began walking towards the stands decorated with food her long furry tail trailing behind her in a slow waving motion. Ah, it was a graceful sight. - To see the ice drakes fill the room in a haste for the several qualities of the festival. Often, festivities took place inside a feasting hall rather than outside, in the snow. Ice cold. Subzero. It was dangerous, and Apolis detested that fact. He was in an absolute state of jealousy, seeing other tribes thrive in captivating scenery and climates... eerie swamps, lush forests, plains of light, platforms high in the ether, volcanoes, dazzling seas.... and the IceWings? A tundra, with little vegetation and scenic areas. The most they had were frozen lakes, of which glowing crystals formed underneath the solid. It was beautiful, but the scenery was not the only thing that bothered him. So many things restricted other tribes from contact from the IceWings. Trade? What could they trade? Snow? The most they could do would be rare herbs, foods, and crystals. But no tribe would ever want such a treacherous territory. He wanted to expand it. Just a little bit. But perhaps, he was overthinking it. Reluctantly, Apolis raised a paw in the air, presenting his prep to speak, as many in the room came to face him. "Attention, my people! My beautiful Ice Serpents, rulers of the tundra and drakes of the ice and cold, today, the council presents to you our occasional Festival! The entire castle is open to the public, but in this very hall is where most festives will take place! It brings me the greatest joy to see you all with such happy faces, it's almost glaring! Let us treat this day as if it were our last! Feast as you desire! - Lope and lurk, whatever your wish will be! The council and authorities are here to help you with anything you need! And I, myself, will be celebrating amongst you all! Enjoy..." He flared his wings majestically, more like a pose, really. Just to hype them up. As the citizens and guards alike began to cheer and chant "Festival! Festival! ", Apolis smiled warmly down to them. It was graceful. And uncommon for the IceWings to celebrate like this. "...and long live the IceWings!" Archelaus made a soft cooing sound which escaped under his breath as he mused at Apolis's words, sceptical as ever Archelaus didn't join in with his fellow kin as they began their uproar of cheers, instead ever remaining with his dignified reserved and distant demeanour. He couldn't help his admiration of Apolis's speech yet the reality of the IceWing's troubles remained ever apparent, the past months had devastated the Tribe as a whole both culturally and economically. Lingering at a threshold which could eventually lead to the Tribes downfall. It was for this reason even so Archelaus couldn't criticize his fellow IceWings for joining in the praise and delight of the festivities, all craved a sense of hope and disillusion from the current realities after all. Manoeuvring himself in a serpentine like manner he moved to gaze upon the food selection, despite his arrogant and domineering posture he once served as a Guardian, and would forever remain such in his heart. As such he moved to search for more humble modest foods out of the large array of assortments. Zaroc listened to his majesty's speech with a keen eye and eager ear, smiling softly as it ended. "Long live the icewings," he said, enjoying the sound of the words. He then caught sight of his absolutr FAVOURITE food. Salmon. Oh, salmon! Once they had permission to feast Zaroc was at the fish before somebody could say stop, and he politely took one and ate it quickly. Mmmm..
Zaroc grinned, and glanced around to see Archelaus looking at the more humble foods. Hm, he looked like a fighter, a bit like that female.. What was her name? Athena? Zaroc adverted his gaze and glanced at the other dragons. He sighed softly. Getting old wasn't.. Fun. Okay, he wasn't old old, but.. Thirty five? Meh. How he wished he was sixteen again. He had spent those days in his lair, locked up to study. He didn't regret it, no, he has gained so much knowledge! But, he sort of wished he'd.. GONE out more. Made friends, got a few girlfriends, that kind of thing. While hearing the Icewings chant some random words, Kyuurei stood still in the spot, being lost in his thoughts. He wasn't really happy with the dragons so far, not just Icewings but all the other dragon tribes as well. He doesn't know how are the other tribes are doing but he just feel so unimpressed at them for some reason. As well as the dragons in this tribes keeps complaining about problems, whatever the problems are, why are they complaining about them? If it's about food and resources, Kyuurei never had a problem about them as he often leaves the snowy land to diet on the leaves and branches of a tree. He don't see any dragons around when he does it so the land isn't inhabited by any tribes. Well, pushing those thoughts and emotions aside and back to what's happening now, Kyuurei listened the Icewings chanting "Long live the Icewings! ", he should join the chant to show that he is staying in this tribe and he may help them with their 'problems'. Near the end of the Icewings' chant, he put on a smile, a smile he had never done before, and may do it in the future... He knitted his brow as he smiles, he softy said in a unusual tone, "The Icewings shall live forever..." After the chanting was finished, he went near the table and took a tuna from the feasting table and put it in his mouth. Still wearing the frowny-smile, he then left the feasting hall. Zaroc glanced over as an icewing male left the hall. Huh. Well, he could understand if he didn't like large spaces. Zaroc was a bit shy, after all, he hadn't gone out out of his den much till hw was eighteen. He looked around, grabbing another salmon as he did so, looking for any potential new friends to speak with. He didn't like standing around and looking like the old sad dragon who had nothing to live for. The familiar chatter of the excited IceWings greeted Artemise as she strode through the doors of the massive feasting hall, just in time to hear Apolis's final words: Long live the IceWings. The edges of her lips curled upwards in a smile, and she paused, murmuring, "Long live the IceWings..." before continuing her stride, her long legs easily carrying her forward. When she was right in front of Apolis, she dipped her head in greetings. "Your Majesty," she greeted respectfully. Raising her head, she locked gazes with Apolis, and the intensity of his thoughtful gaze made her turn away and trot towards the feasting table. He was most certainly thinking, probably about the harsh tundra of the IceWing territory. And about how they would survive. It would be best not to disturb him. She arrived at the feasting table, which had plenty of food on it, and a few IceWings caught her eye. There was one bulky IceWing that was definitely a Guardian; he was moving towards the area of the long table which held food that was modest; there was another IceWing feasting on salmon, who had an intelligent look about him; lastly, there was a furred female smiling at everyone. She made her way towards the Guardian, hoping to start a conversation with him. Artemise stopped when she was a step or two away from him, and opened her maw to speak. "Today is a very lively day. Much unlike the dull quiet days of our everyday lives," she stated, glancing around. Her gaze landed on a draping that displayed Apolis in a regal pose. Right below it was a stony-faced guard who stood so still that she would have thought he was dead, if not for the slight rise and fall of his chest. The guard sensed her gaze, and he stared back at her, his facial expression remaining as blank as ever. She frowned slightly and broke their eye contact, returning her attention back to the male she had spoken to. "Those guards... They are so quiet that it is almost creepy." While waiting for the male's response, the Semi-Goddess stared around at the food that was laid out in front of her. Oh, such an assortment of food. Which to choose? She picked the platter that had some roast elk on it; only then did she notice her hunger. She wolfed down the strip of elk and looked around for another one; upon findng one, Artemise reached out to grab the platter, and then, when she was sure no one was looking, gobbled down the food in an undignified way. And then she licked her lips and dug her claws into the ground, resisting the other plates of food that beckoned to her. Trying to distract herself from the food, she politely asked the male for his name: "May I know your name?" Zaroc glanced up again at the king and felt chills run down his spine. He was a symbol of bravery and endurance, something the Icewings took pride in. They were a tough little Tribe, despite all the troubles that plagued them. Zaroc hadn't a clue how the drake coped with all this, on top of the millions of other things. Admiration was clearly in his gaze, and he forced himself to look away for fear of being seen as disrespectful. Devouring most of the salmon, Zaroc glanced around the hall to see a few dragons. 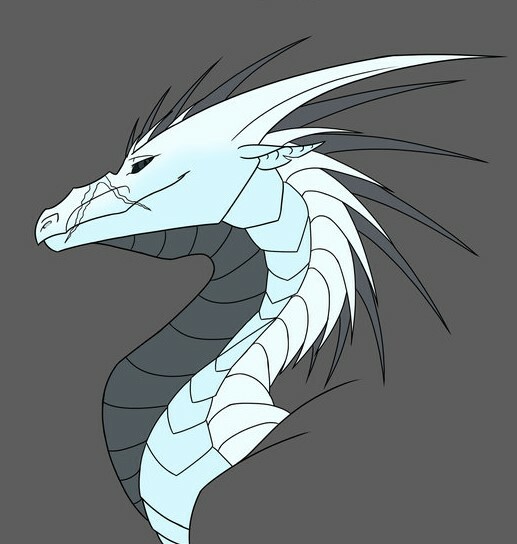 One was a reserved looking male that didn't seem to be one you'd mess with, there was a female icewing with a scar and an aura of icy power around her. Then there was the king, who was, of course, the delight of the festival. Shooting another admiring glance up at the king, Zaroc absent mindedly grabbed something, he didn't know what it was, and didn't think about checking what he was eating until it was going down his throat. Zaroc started choking, gagging as he put a wing over his mouth, trying not to attract attention to himself as he tried to cough up whatever it was in his mouth. Oh, why hadn't he CHEWED the damn thing! He could breathe, thank the gods, but it felt horrible! The thing lodged in his throat, Zaroc's quiet choking sounds became a little louder. Oh god, he was going to be SERIOUSLY sick..
Dashing out of the hall, Zaroc nearly slammed right into a guard, who sent a glare his way as he dashed out of the hall and into the maze that was the icewing palace. Eventually, after many twists and turns, he found a balcony that dropped off into nowhere and finally coughed up whatever it was, some time of hard food. It fell into the abyss, and Zaroc heaved a sigh of relief. Shaking from the horrible experience, Zaroc whiped his muscular lower jaw of saliva with his wing and gave a low growly 'brrrrr,' sound. The screeching sound of claws skidding on ice suddenly rang through the feasting hall, as a variety of energetic, and rambunctious, wolf dragon pups would dart through the feasting hall. Well, they weren't pups, but they might as well be, considering how the acted sometimes. And while Virgo didn't act nearly as insane as she once had been, she was certainly the fastest of all the pups, and thus, with her sudden stop, had been her claws that had caused the noise, which made all the IceWings within a close proximity to her flinch. They had been there for Apolis' great speech. So, of course, at the sound of so many IceWings suddenly chiming in, the young 12 year old pup (She's 12 because idk how far back this topic is from o3o) would suddenly let out a howl, chiming into the cheers. "Yeah! Long live the IceWings! WOOO!" she'd shout in a hyper tone, bouncing around her mother's legs, since her mother was quite big compared to her. After that fiasco, Virgo would practically tackle Taurus, causing him to slip on the icy floors, and sending the both of them sliding into the nearest wall. Taurus groaned angrily, but before he could get mad with Virgo, she'd grab his tail, and drag him over to the food. At the sight of food, the other kids joined in, running over to the banquet tables. All fifteen of them. Virgo grabbed herself a live salmon with super speedy reflexes, wolfing it down, before rushing over to the table that had all the elk, and grabbing herself a big, tasty slab of venison. Her other siblings took some, too, of course. When she was done, she looked around, wondering if there was anyone fun to talk to. She spotted a fluffy dragoness, alongside a really big dragoness, and decided to go say hi to them, pouncing and sliding to greet them. "Hi!" she'd say enthusiastically, "My name's Virgo! Who are you? This sure is a nice party, huh? I've never been to a party like this! Really nice! I wonder if they have shark here?" the she wolf would ask, mostly to herself, with a lick of her lips. She had never seen a shark, but she had heard from her mother that they tasted really good. Archelaus was settling his decision upon the various selection of foods, examining them through his cold gaze as he seemed to entertain himself with his tail trailing back and forth behind him against the cool stone under him. His internal musings were only broken when he heard a voice directed towards him, his first reaction was one of slight surprise although he betrayed none such emotion as his eyes shifted to view the Dragoness now beside him. He didn't turn directly to face Artemise but none the less regarded her with a solemn nod of acknowledgement, his posture ever dignified and regal. First choosing to merely avoid a conversation to remain in his silent solitude Archelaus relented when she continued, following her words he turned his own attention to the dutiful sentries standing guard beside the their liege and King, narrowing his glare in silent scrutiny at them as he thought of making a snide humours comment, however bit back his words to degrade the Royal Guards and instead replied to the Dragoness courtly "They do have a bit of an atmosphere about them. Perhaps standing still for far to long on parade has made them a bit dull". Snickering under his breath at his own remark he then turned to face Artemise head on as she asked his name. "Archelaus, its a pleasure. ", he stated confidently with his charismatic well cultured tone before he followed up with a soft smile, although, due to the mutilated scars what cross over his maw the smile seems more contorted into a wicked sadistic grin. His eerie unnatural ebon stare now locked upon Artemise as he awaited for her to make her own introductions. Upon hearing a "hi! ', Artemise turned her head slightly to see a wolf-like female who was significantly smaller than her introduce herself. Virgo was her name, huh? She dipped her head slightly in response and was going to give her name too when she heard the male next to her speak. She slid her gaze back to him, and grimaced when she saw his brutally scarred face. How had she not noticed it before? It was probably her brain dismissing the scars as a trick of the light when her gaze had first landed on his face. She'd have asked him about what had happened if he had not made a remark about the guards she'd mentioned earlier; her grimace turned into a smirk. Ah. He had humour; something she missed. His charming voice was well-cultured, and that gave her a rather good impression of him. Many females probably swooned the moment he'd talked to them. But the smile.. She was sure it was meant to be nice, but the scars... Ugh. Her lips tightened slightly but they parted again as she tried out his name. "Archelaus? A very unique name," she said. It had a nice... ring to it, and she loved the way it rolled off her tongue. Her smirk widened as she purred, "I'm Artemise. Nice to meet you." Her tail curled around a haunch, a habit she'd feel uncomfortable without, as she studied his features. He was certainly very handsome; her heart fluttered when she locked gazes with him, and his eyes, which were as black as the darkest night, enthralled her. Pulling her in. She hastily broke eye contact, instead focusing on the other parts of his face. Handsome, yes, but he had a sly, cunning look. But that didn't ruin his features. It made her want to.. want to.. touch him. She pushed that thought away with a firm no!. Her smile, which had disappeared the moment she'd locked gazes with him, returned on her face, but it was more of a genuine smile instead of a smirk this time. She lowered her voice as she spoke again. "Do you mind if I ask about your...scars?" she asked, overwhelming with curiousity, which showed on her face. "If you don't want to talk about it, though, it's fine." Archelaus was used to those asking about his remarkably unusual name, it caused him to only radiate with his smug smile that ever bit more. The name was always seen far more formal and most Drakes even his kin within the Icewings usual said it with a rather uncomfortable crease across their brow as they punctuated it, the Dragoness before him now though said it with such fluentness he considered himself impressed as an almost gleeful soft coo escaped him as she repeated his name. “Well, whatever was going through my parents head when they decided upon Archelaus was beyond me, perhaps they thought I wouldn’t of just settled as a Guardian”, he stated matter-of-factly although there was playfulness in his voice from the comment. “It is an honour Artemise”, Archelaus then replied upon finding out her name, his tone returning to its formal sense and tone. In that moment as their gaze locked, the eyes what stared back at him were a a stunning midnight blue quite like anything he had seen before. As she broke the eye contact he could only wish that she waited a moment more, almost in an dazed degree of bliss. Archelaus took the moment to briefly examine her visage silently, her lean well shaped form caught him off guard from what he initially assumed when she first spoke. It was pleasing to then hear her soft voice again as she asked about his scars, he was used to most avoiding asking the question or merely pretending they weren’t there. The acknowledgement to his facial scarrings was something he admired. “Well… My own foolish actions caused it really. A reminder of my own hubris and arrogance”, he gave a hearty laugh under his breath as a means to keep the words warmer and less depressing, “They’re from another Dragon, a Rogue I thought I could overpower which I saw when patrolling the Nightwing borders. I charged head on thinking I could overpower him. It ended as a stalemate, but he did leave his little reminder”. Archelaus let out a soft sigh before his smug smirk returned as he added “I don’t know though, they’ve grown on me. Others think they’re rather fetching”. As he spoke about the unknown, mysterious things swirling in his parents' heads when they decided to name him Archelaus, Artemise locked gazes with him again, and she did not pull away this time. She could feel a tingle of excitement running through her body as her eyes explored the depths of his dark, dark ones, and she could barely hear what he said, but she heard it all the same. The noise of the other IceWings around her dissolved into a quiet, dull hum. "Yes," she murmured. "It's very, very fetching indeed. But why were you patrolling the NightWing borders? Aren't you an IceWing?" The dragoness was barely conscious of what she had just asked; she was more concentrated on his ebony dark eyes, which held so many secrets and a promise of something good. But of what? She had no idea, but she continued to search his eyes. It was like a whole new world. Artemise didn't know one could find so much in just the two orbs that served as eyes, but here she was. If she could describe the world she found in his eyes, she would say that it looked like... like a planet made out of ebony. That was all she could say. As she continued gazing into his eyes, she suddenly was aware of her heart hammering against her chest and the continual tingles running through her body. A crease formed between her eye ridges. She had never experienced this type of reaction just by locking gazes with someone. What was it? But still she did not break eye contact, for she found pleasure just by looking into his eyes. Around them in this moment all Archelaus assumed was that everything was nought but white noise, the festivities and the merriment of the other Dragons were gone from any cognitive thought as his entire focus was fixated upon Artemise, releasing a soft tenor croon as she mentioned his exploits within a different territory he briefly looked over himself examining his silvery-white scales “Well, I hope I’m an Icewing, otherwise I think I have some explaining to do”, another slight snicker escaped under his breath at his own witty remark as he turned back to face Artemise. Oblivious to the world currently around him he continued in a more serious tone which seemed to be laced with signs of regret “Foolishness really why I was out there, I thought to impress our King with information on the Nightwings back after when their Queen Gemini abdicated and allowed their new leader to take her seat”. Raising his right talons he traced gently over his scarrings “Foolish”. He didn’t want to turn away from Artemise again after that brief moment, looking at her was if a silent promise of peace and prosperity. She seemed to calm him and his previously stalwart apathetic visage was gone as he relaxed and softened his expression while looking upon Artemise. It overcame Archelaus suddenly when something stirred inside of him that he couldn’t care less about the festivities or even the Tribe, he just wanted more time with her, this extraordinary Dragoness who he didn’t even seem to know the name of moments before.